Residents of East Brunswick enjoy their close proximity to New York City, top public schools, and the southern shores of the Raritan River. Incorporated as a part of Middlesex County, East Brunswick is also home to an important community hallmark, Frost Woods Memorial Park & The Sanctuary of Abraham. Frost Woods Memorial Park is located next to Frost Woods Park, a 120-green acre preserve. This beautiful, natural area of East Brunswick provides community members and loved ones a setting for quiet reflection and remembrance. The grounds of Frost Woods Memorial Park are surrounded by lush greenery year-round, providing a gorgeous natural environment for all. Currently, the cemetery offers In-Ground Burial, Above Ground Mausoleum, and Both In-Ground and Mausoleum options for Cremations. 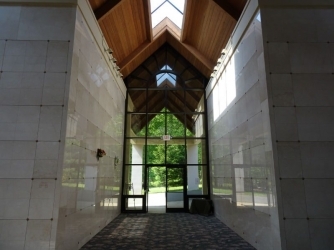 We proudly offer the most beautiful mausoleums in East Brunswick providing peace and tranquility to all who come visit. As a family owned business, Frost Woods Memorial Park proudly offers individualized services to meet the needs of our diverse customers. We highly encourage pre-planning before a death, to ensure that all wishes and arrangements are taken care of according to your plan. We also offer funeral services, even for in-ground burials, inside of the Chapel in the case of inclement weather. Our number one priority is to ensure everyone is comfortable during this time. Frost Woods Memorial Park & Sanctuary of Abraham is located at 384 New Brunswick Ave. in East Brunswick, NJ 08816. Please call 732-834-9600 to make arrangements or begin the easy pre-planning process.